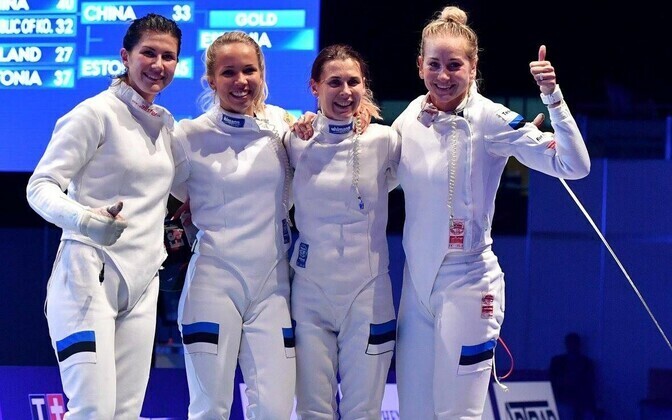 Estonia's women's épée team, consisting of Kristina Kuusk, Julia Beljajeva, Erika Kirpu and Irina Embrich, was crowned world champions in Leipzig, Germany on Wednesday after defeating China 45:33. Estonia was free in the first round, after which it solidly defeated Hong Kong 45:17 in the round of 16. In the quarterfinal, Estonia bested Germany 12:11 in a low-scoring matchup, after which it moved on to conquer Poland, who had themselves eliminated Russia 45:41, in a 37:27 matchup. The Estonian team faced China in the finals, who had themselves eliminated South Korea 40:32 in their own semifinal matchup. The final began evenly, with Beljajeva earning a 3:3 tie in her first mini-match, however Embrich brought Estonia into the lead with a score of 8:5 and Kuusk continued with 13:6, after which the Chinese team was unable to recover. The bronze in Leipzig went to Poland, who defeated South Korea in the bronze-medal match 33:28. On Sunday, July 23, Julia Beljajeva, who had previously been crowned world champion in 2013, earned bronze in the women's indiviual épée after being defeated 13:12 in overtime in the semifinals by Russsian Tatjana Gudkova, who went on to win gold. Poland's Ewa Nelip took silver after being defeated 11:9 by Gudkova. The newly-crowned world champion women's épée team will arrive at Tallinn Airport together with their trainers on a flight from Frankfurt scheduled to arrive at 5:10 p.m. The Estonian Fencing Association welcomes all fans and sports enthusiasts to join them at the airport in welcoming the gold-medal team and their trainers back to Estonia.